What is subrogation? When do we need waiver of subrogation? Importance of waiver of subrogation. You can follow our step by step instruction to fill out subrogation waiver form easily. Free of Charge! 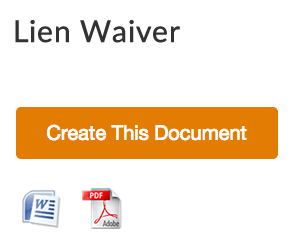 What is Unconditional Lien Waiver on Progress Payment? Unlike a conditional waiver of progress payment, the unconditional waiver of progress payment does not guarantee you a payment for the services extended by you towards your client as it releases your liability rights to the property as soon as you sign it. It does not matter any longer whether you receive the payment by the through date mentioned on the form. The form itself mentions something to the tune that if you do not receive the payment by the through date mentioned then it is not anybody’s responsibility and that you should get a conditional waiver and release on a progress report form. How is it different from conditional waiver on progress payment? The only difference between the conditional waiver of progress payment and unconditional waiver on progress payment form format is that in the financial institution detail section of the unconditional waiver, you only need to fill up the amount that you are expected to receive. The firm also does not provide any space for claims for unpaid waivers unlike in the conditional waiver on a progress payment form. The unconditional waiver of progress payment will release the claimant’s right from the property of the client as soon as it is signed and will remain released despite non-payment of the full amount by the through date. Basically the unconditional waiver of progress payment will free the client from any stipulations and should not be signed unless and until the claimant trusts the client on payments from the past projects that were worked on together with them. This is almost like confirming that you have received the payment for the work done and are required to relinquish rights to the property even before you get the money for the work done. The conditional waiver of progress payment at least ensures payment by the through date mentioned on form even if it waives the right of the claimants to the property as soon as they sign it. The general advice is to never go for the unconditional waiver of progress payment as it does not protect the interest of the claimant. The waiver works to the advantage of the owner as he can make the payment to the claimant at whatever time he wishes to depend upon his/her financial situation. In cases like these where there is enough confidence in the client that the payment will come through eventually and there is no need to necessarily make him/her liable for unfulfilled payment through a specific date then this is a safe waiver to sign. What Leads to a Successful Subrogation Program?